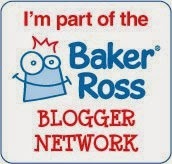 As you know from previous posts, we are part of the Baker Ross Bloggers Network, and we get to try out lots of their brilliant craft kits. Elliot gets very excited everytime he sees a box arrive because he knows that something fun will be inside!! Our most recent box of goodies included lots of seasonal items. 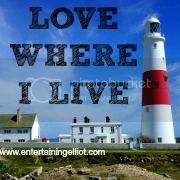 There is so much going on at this time of year with Halloween, the Rugby World Cup, Bonfire Night to name a few and the craft items we were sent reflected this colourful time of year. Eagle eyed Elliot spotted the toys straight away! 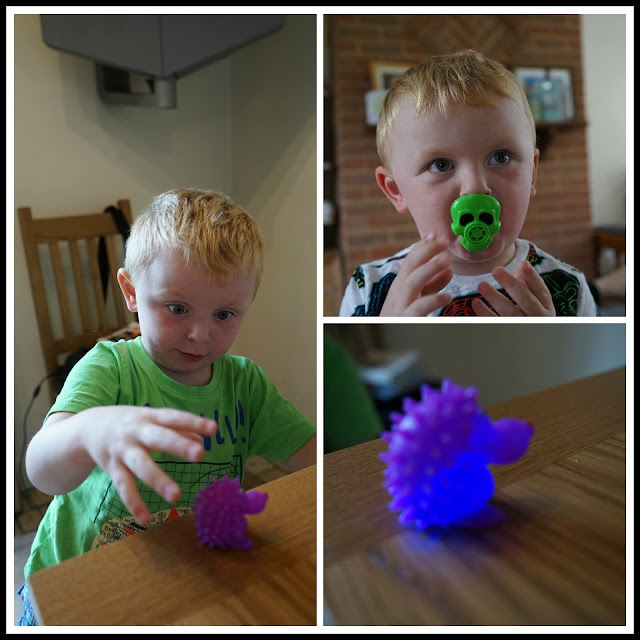 We had a selection of spooky skull whistles and little squeezy hedgehogs that lit up when bounced. I had no idea that Baker Ross sold little toys like this but they are perfect for party bags. I am throwing a 'spooky'party for Elliot's birthday in November so I will definitely be ordering some of these little items for the party bags. Maybe it's just my child but he loves all these plasticy toys - he has a drawer just full of them! Our first make was the spooky bat bucket kits. 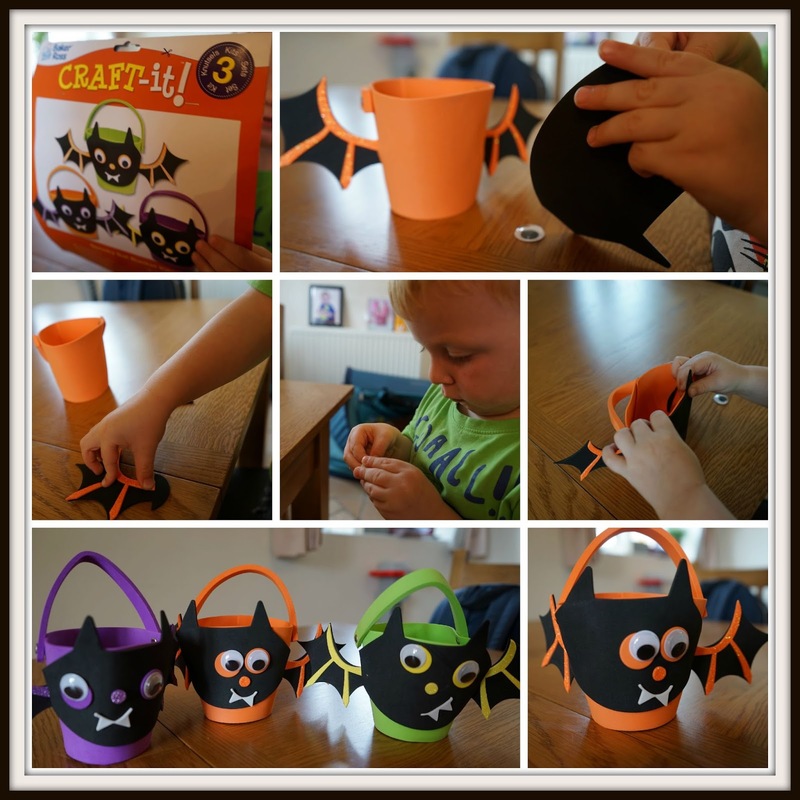 I love the Baker Ross craft kits because they're always nice and simple and really fun for Elliot to get involved in. These ones were right up his street because he loves anything spooky!! Everything we needed was in the kit so we got started right away. Obviously he needed a bit of help with the fiddly bits but the finished result was pretty good. We then moved onto the hedgehog leaf decoration kits - these were a very simple idea but very effective! It was so easy to stick the leaves onto the hedgehog and I loved the Autumnal colours. Again, this kit came with everything we needed so it's perfect for a quick crafty activity. Elliot was still enjoying our morning of making so we decided to try out the glitter stickers too. We've had sticker packs from Baker Ross before and they are brilliant - the bag is stuffed full of stickers! This one was no exception, lots and lots of different stickers and great Halloween colours too! 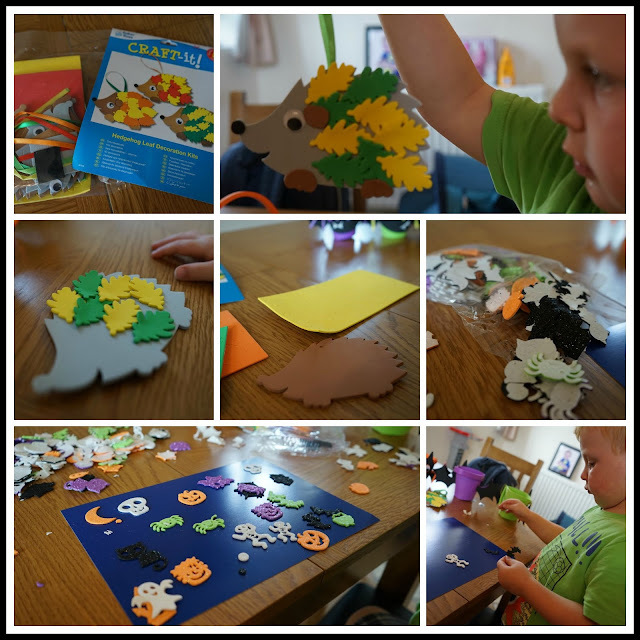 We used a piece of card from our craft box in a nice dark blue which we thought looked like the night sky and Elliot had a great time peeling and sticking. We have tons of stickers left too! As you can see, these craft sets are perfect for pre-schoolers and perfect for Mums who aren't very creative...like me!! We had a great time getting crafty and still have the Rugby finger puppets and Rocket stained glass effect decorations to make....we are saving them for our next rainy day! All the above items that we have reviewed cost under a fiver which is an absolute bargain. The kits look fab - perfect for keeping little hands occupied!